The PC1043 Power Converter is the perfect compliment to our HL1040 Infrared Heat Lamp & HL2040 Infrared Heat Lamp with Flip-Up Base that is rated for 110Vac. International customers can add this simple converter to their HL1040 or HL2040 purchase and be equipped to conduct their sales presentations anywhere in the world. 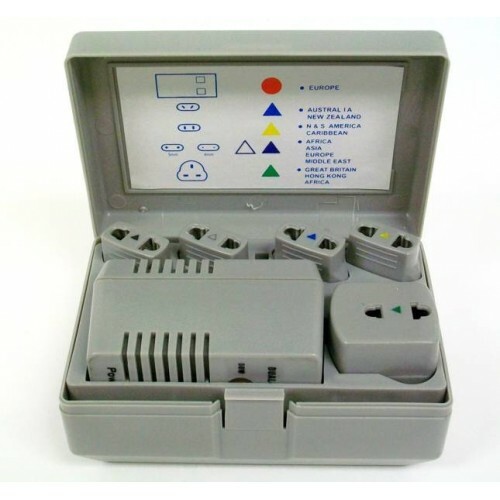 The PC1043 converts 220/240Vac to 110Vac and includes adapters for Europe, Australia, Africa, Asia and South America. 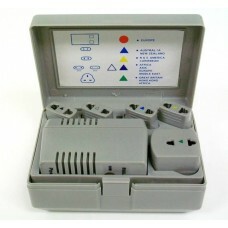 The converters and adapters are conveniently stored in a rugged carrying case (included). NEW: Infrared Heat Lamp with Flip-Up Base The Infrared Heat Lamp is an essential part of a successful sale. The sun's radiation accounts for 70% of your customer's heating and cooling bill. While Freeze Spray demonstrations only deal.. The Window Energy Profiler Sales Kit Give a thorough, compelling demonstration that will win your customers over. The Infrared Heat Lamp and Temperature Gun are classic demonstration tools that most can relate to. But the Window Energy Pr..
Infrared Heat Lamp The Infrared Heat Lamp is an essential part of a successful sale. The sun's radiation accounts for 70% of your customer's heating and cooling bill. While Freeze Spray demonstrations only deal with the secondary effect of con.. Window Energy Pro Demonstrate the energy efficiency of your window product. The EP3500 is specifically designed for large scale presentations or show room displays. The bright and bold LED displays ensure that your performance numbers can be s..